On July 12, Greenworks Commercial opened the doors to its Mooresville, N.C., headquarters to unveil the first production models of its Lithium Z zero-turn mowers—the first lithium-powered mowers to be UL-certified for safety. 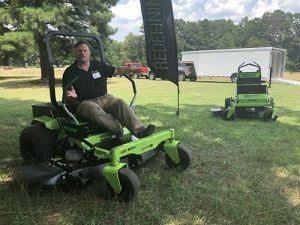 At the company’s Lithium Z Media Launch event, Tony Marchese, director of independent retail for Greenworks North America, discussed the full range of Greenworks equipment. He noted that the market for battery-powered equipment is experiencing rapid growth similar to the electric vehicle market. What’s behind the power of this new cordless equipment? The switch from nickel cadmium to lithium ion battery technology. “Lithium ion batteries have really been the game-changer—it’s lighter, more powerful and it’s allowed the industry to go from low-voltage tools to high-powered gas replacement tools,” said Marchese. Driving the growth of cordless power equipment are noise and emissions restrictions on gas-powered equipment. According to Greenworks’ aggregated research, in October 2017, 250 cities in the U.S. had noise regulations, and today, that number has shot up to 500 cities. He explained that with quieter, zero-emissions tools, landscapers can work an additional three to six hours a day—hours that that were previously lost due to noise and pollution ordinances. Versatility—the batteries are interchangeable for use in multiple tools. The benefits seem to be catching on in the industry. Juli Denike, market insights manager for Greenworks, cited a recent Outdoor Power Equipment Institute study which noted that battery powered outdoor power equipment (OPE) is currently 24 percent of market share, a 92 percent increase from 2008. Denike said the electric products are on the path to surpassing gas-powered equipment purchases this year. Despite the upswing in electric equipment in the industry, a major concern for many landscape pros is the battery life and the price of this equipment. Greenworks is working on changing that perception on both counts. The company will be providing more on-the-go charging options with the release of a rapid six-pack battery charger, which will allow landscapers to carry back-up batteries with them in the field and keep crews running all day. 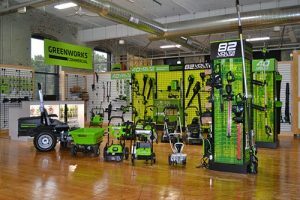 As far as the price of electric equipment, the Greenworks team acknowledged that it’s been a shift to educate the industry on the upside, especially when faced with a higher price point on large outdoor equipment, such as mowers. Marchese said that it’s a matter of explaining that you’re buying your fuel upfront, and that you’ll see cost savings over time. These cost savings include not having to purchase fuel or repair equipment and saving time by not having to perform daily maintenance. 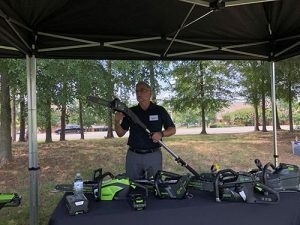 At the media event, the Greenworks team took to the grounds of the Mooresville Golf Club to demonstrate their 82-volt commercial and 40-volt residential equipment in the field. The range included blowers, edgers, string trimmers, pole saws, chainsaws and push mowers, as well as battery-charging equipment. The run time of the tools can be extended by attaching them to the GL 900 backpack battery, which supports two batteries. The star of the demonstration was the Lithium Z line of zero-turn mowers, featuring a 48-in. stand-on mower and a 60-in. ride-on mower. Both offer users zero-turn radius maneuverability in addition to zero gas and zero emissions. They are powered by an 82-volt 13.8kW lithium-ion battery and feature three 1.5KW brushless blade motors and two 1.7KW brushless drive motors. Both Lithium Zs delivered a great cut and power, Greenworks officials said, but during the outdoor demonstration they emphasized the sound difference the most. At a short distance, the street traffic near Mooresville Golf Club drowned out the sound of the equipment. Here are the specifications of the Lithium Z mowers. • Weight of 1,321.5 lbs. • Weight of 1,120 lbs. Both mowers come equipped with electromagnetic parking brakes for added safety and offer a 90-day blade warranty, two-year (or 500 hour) frame warranty and three-year battery and motor warranties. The Lithium Z mowers are available through the Carswell, Carswell OEI, Conniff, Edney, Pace and Steven Willand independent dealer networks. Video content provided by Greenworks Commercial.